This entry was posted in starbucks and tagged Coffee, Starbucks. Bookmark the permalink. Just have to say I was reading this while frantically searching for a Starbucks at the Miami airport. While I rarely if ever go by Elizabeth I always do at Starbucks because Liz just sounds like too many other names and they usually get it wrong! You got out!! !Enjoy the sun and the Starbucks. I loved this post! Between my first name and my last name, I can’t even begin to identify the number of ways they can be butchered….I think using an alias is a fantastic idea. Too bad I can’t use one at hotels because of that whole pesky identification verification issue….they are frequently the WORST offenders! Great post. I totally get it. My name is Joyce, but people something think I’ve said, “Theresa.” I don’t bother correcting them. Recently, I called Comcast and said, “It’s Joyce, and the women said, “Oh, Theresa is my name too. How do you spell it?” I told her “without the H.” The lies get deeper and deeper! That’s so funny. How in the world do they get to Theresa from Joyce but I get it? You should see what they do to Helene. 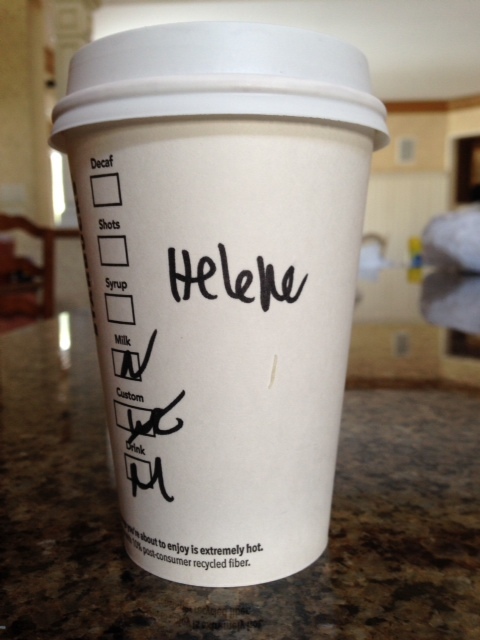 Loling at this… I usually get Helen, but often Elaine or Helaine. Never thought to have an alias but I might give it a go! I get Helen all the time also. Yes. I can see where Roni would be an issue but it’s a great name. Hang in there. Spring is coming. Whenever it’s crowded I just say “Dee” at any of those places where you have to give a name. It’s really hard to misspell and since its not really my name I don’t care! So funny: I also have a Starbucks alias! I go by BB, figured you can’t go wrong w/that one verdad? ; ) p.s. That too is an alias. I just came across this post. My mother’s name is Helene and my name is Laurenne and we both do the same thing. My Alias is Jane.